The Trybike Natural Wood 4 in 1 Balance Bike is designed to give you the perfect all-in-1 bike to help your child transition from crawling, to walking, to balancing, to riding. Suitable for children from 12 months to 6 years and providing excellent value for money, this Trybike is also particularly suitable for disabled children or children who find it difficult to keep their balance. Made with sustainable resources to provide a thoroughly durable construction, the Natural Wood 4 in 1 Balance Bike combines sturdy practicality with a quality finish. 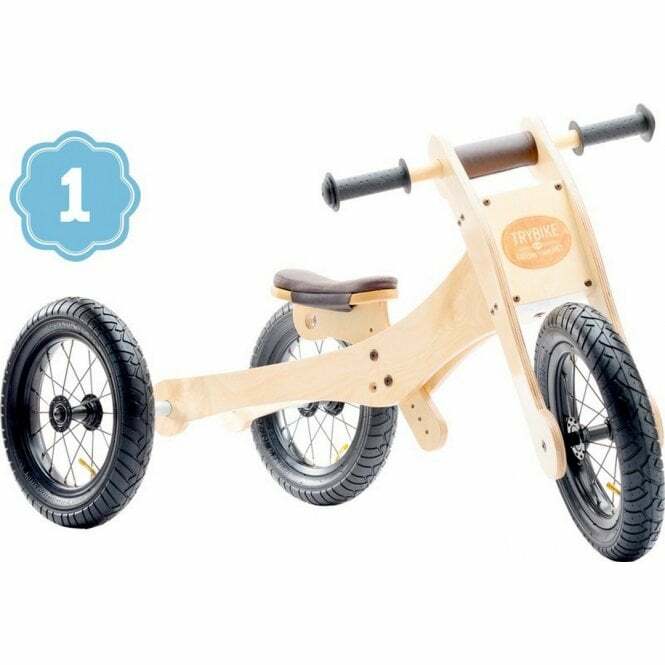 Why should I choose the Trybike Natural Wood 4 in 1 Balance Bike? The Trybike Natural Wood 4 in 1 Balance Bike is made from hardwearing, weatherproof marine birch plywood. It is ideal for giving your child lots of support in learning how to walk and then ride. From 12 months old, the Trybike Natural Wood 4 in 1 Balance Bike is initially a tricycle, propelled by your child's feet (which also act as the brakes). It can then be converted, in a very few steps, into a low bicycle (around 2-4 years). Thanks to the ingenuity of its chassis design, once you child is slightly taller, you simply turn the frame over. This moves the seat up in to a higher position to match longer legs. Or, of course, if your child needs further support, these stages can be followed but in the original 3 wheeled option. Having a lot of fun on this Trybike, your intrepid traveller from 2 to 6 years can start to learn how to balance with confidence. With the seat that adjusts in height and position, this Trybike grows to suit your child's needs as they themselves grow. Designed in The Netherlands by Co&Co with a tight turning circle a London cabbie would be proud of, the Trybike Natural Wood 4 in 1 Balance Bike is easy to manoeuvre. With a natural wood chassis and black grips with a brown seat cover and brown chin guard, this Trybike is comfortable to ride and great to look at. The seat features a hole in case you would like to attach a light, or trailer or a pulling rope. The seat tilts backwards so that as your child's legs get longer, they are positioned further away from the the handlebars. What are the specifications of the Trybike Natural Wood 4 in 1 Balance Bike? The seat height ranges from 27cm to 50cm and the brakes are your child's feet! As a tricycle, the Trybike weighs just 5.5kg then as a bicycle it weighs 4.1kg. The spoked wheels are 12 inches in diameter. The nylon bushings, sealed, smooth cartridge balls and extra wide rubber tyres with inflatable inner-tubes all provide a smooth ride. Combined with the sturdiness of the wooden chassis, this Trybike Natural Wood 4 in 1 Balance Bike is sure to become a favourite playtime friend.